He's been ripping for years, so we thought it was only fair that we gave him a pro model. Welcome to the big leagues, Toad! 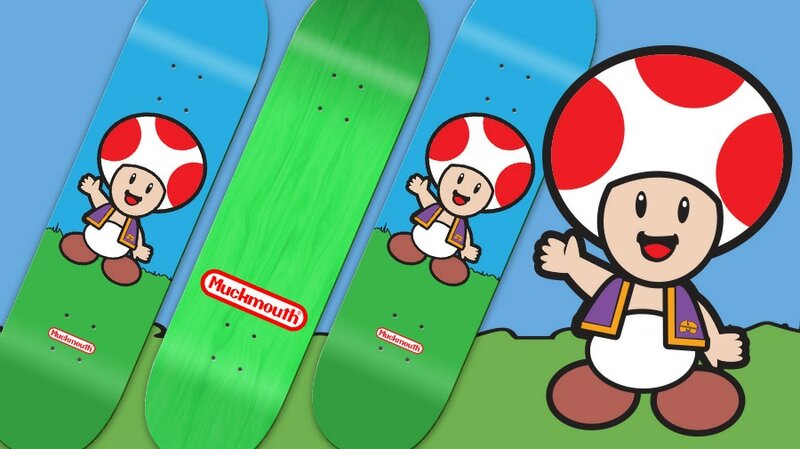 The Muckmouth Toad pro model is strictly limited to just 50 boards and pressed and printed at Prime Wood LA. Sizes available: 7.75", 8" and 8.25"
Please be aware that all costs stated here are in NZD, so please check up the exchange rate (xe.com) before having a heart attack. The boards are $90 New Zealand Dollars and can be shipped worldwide. The boards will be available in late March and we will update via social media when we get an exact date. The one slight bombshell for those that live in the Northern Hemisphere is that shipping isn't super cheap from New Zealand - but on the plus side, the NZ Dollar is worth next to nothing these days, so after conversion it shouldn't be that bad at all. Plus if you want to buy two boards, the shipping becomes even cheaper (see full shipping breakdown below). If you'd would like to order more than two boards, then please email: alex@muckmouth.com for a quote. When paying from outside of New Zealand however, please use PayPal instead. Payment to PayPal is payable as a GIFT (please click on 'personal' then send as 'gift') to: alexdyer101@gmail.com - if marked as a gift it shouldn't incur a fee from either side, so please make sure to send the money as PERSONAL GIFT - rather as payment for an item or any of their other options. We aren't going anywhere, so don't worry, this is just to stop us having to pay absurd fees on every transaction.